I have never slept so well on an airbed. Even though we were in very cold conditions, the flocking kept us warm and the depth of the airbed makes for a very comfortable nights sleep. The only reason I haven't given it a five star is that each morning we had to top it up a little as it did lose a small amount of air through the night. Would still recommend it though because putting a little air in was no major problem. Very convenient bed. The size is convenient too.But approximately for 4-5 day the seam dispersed. 5 gram tube of superglue and piece of an insulating tape helped. Further everything was good again. So only 4 stars of raiting. 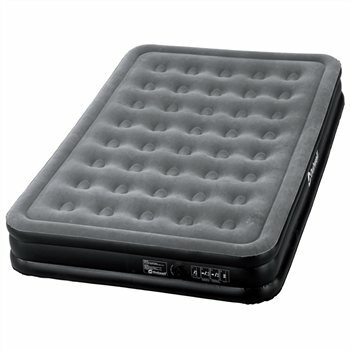 Good value for your money, compared to our last air bed which was a intex good quality bed this outwell me and my wife found this air bed more comfy go get one. I presently haven't used the product, but just want to say the services I received from camping world as usual was first class. We've just spent two and a half weeks sleeping on this bed. One of the best investments we have made this year. Hi can I use a 12 volt air compressor to inflate this product?